When you want to talk to a woman no matter where you see her, you need to act quickly and be confident and when you start conversation you also make sure that conversation do not stuck and continue. If you behave nervous that means you are going to get rejected. 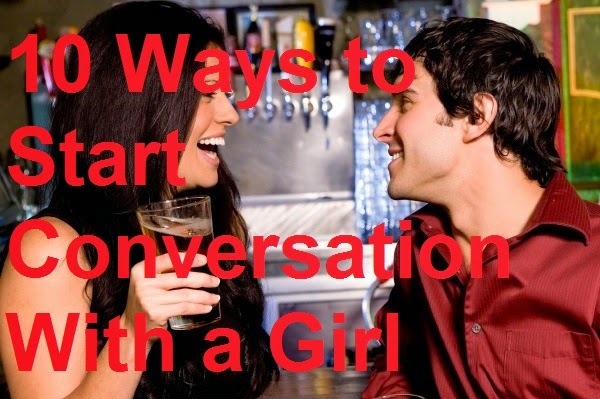 10 Ways to Start Conversation With a Girl ? If you sitting next to a girl in library, look at what she is reading to know in which class she is studying. You should ask her about grading and teaching. Talking about school things will keep the conversation going. Observe the coffee shop. If there are some special coffees then ask the girl if she has tried any of them. If she did then ask her to recommend you some new drinks. If she has not tried any of them, then recommend her to try a new coffee. Look with a good eye. if you see that she is holding a book than go to her and ask about that book. A good opener line will help you here like, "Hi there. I see that you are carrying Sona Mathews's 'eAskme.' I heard its a stimulating read. have you make of it so far. Ask girl about what she like to study or think about class before the class start. If she have not attended class in last few days than ask if she want you to recap her the stories. You cna ask her to join study group. Comment on her food, if you see her buying anything. For example, "Hi! I noticed that your pumpkin looks so fresh and green. I personally love baking it and it taste good. What do you usually do with the pumpkin?" If you see women at a specific store like a music or books store. See which type of music she is looking for. Ask her to recommend you some music. If she like talking to you, than she will suggest some good. You can ask her about the band that is playing or about to play the music. Great way is to ask about if she is fan of that band and ask her about other bands in which she is interested. Pickup lines work great sometimes. Even silly and horrible one-liners also show your sense of humor. make sure she like what you say. Being straightforward and honest to start a conversation. Always tell her the truth. You can ask a woman to help you to decide about your clothing. Invite her to explain which Shape, color and cut will be best for you.